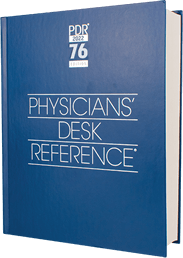 Listado en la referencia de escritorio de los médicos 2019! ¡Los productos de PureTrim se enumeran en la referencia del escritorio de los médicos de 2019! Los médicos y farmacéuticos se han estado refiriendo al PDR por más de 60 años. PureTrim es una de las pocas empresas distintivas con productos naturales enumerados en el PDR. PureTrim se enorgullece de tener sus productos enumerados en la Referencia de escritorio de los médicos para medicamentos sin receta y suplementos dietéticos. A continuación se muestran los listados reales que aparecen en el PDR, tomados de la Referencia de escritorio de los médicos. Natural, Vegetarian Weight Loss Shake, High Protein, Low Carbs, Less than 1 gram of Sugar. No Soy, No Whey, No Dairy, and No Aspartame. Less than 200 calories per shake. 21 Gram Protein Blend: NON-GMO Vegetable Pea, Organic Brown Rice, Organic Lentil, and Organic Flaxseed. Blend of Antioxidants, Prebiotics, 500mg of Plant Calcium, 8000mg of Essential Fatty Acids & 1100mg of Super Greens Blend. Mix contents of shake in 10-12 oz. of chilled water. Have 2 shakes a day (one for breakfast & one for your evening meal.) Drink 2 glasses of water after you drink your shake for best results. Once weight loss is achieved, reduce to 1 shake a day for maintenance. Do not use if you are pregnant or nursing. Must be 18 years or older to use. Do not use as a replacement for more than two meals per day. Organic Acacia, Avocado (Persea gratissima), Organic blue agave Inulin, Turmeric extract (Curcuma longa), Red Algae, Organic spirulina, Organic apple, Organic kale, Organic broccoli, Organic spinach, Organic carrot, Organic parsley, Organic beet, Organic green cabbage, Organic blueberry, Organic raspberry, Organic strawberry, Organic tomato, Organic alfalfa grass, Organic barley grass, Organic wheat grass, Organic blackberry, Organic lemon, Organic pear, Organic sweet potato, Organic cranberry, Organic pumpkin, Organic grape, Organic pomegranate, Organic cherry, Organic adzuki sprout, Organic amaranth sprout, Organic buckwheat sprout, Organic chia sprout, Aspergillus melleus and Aspergillus oryzae, Bromelain (Pineapple Stems), Organic flax sprout, Organic garbanzo sprout, Organic lentil bean sprout, Organic millet sprout, Organic pumpkin sprout, Organic quinoa sprout, Organic sesame sprout, Organic sunflower sprout, Organic chlorella, Organic green tea leaf (Decaffeinated) Seaweed blend (Undaria pinnatifida, Laminaria japonica, Porphyra yezoensis), Astragalus root extract. Do not use if you are pregnant or nursing. Must be 18 years or older to use. Keep out of reach of children. PureTrim Boost Tea will help boost your metabolism and reduce your appetite and food cravings! 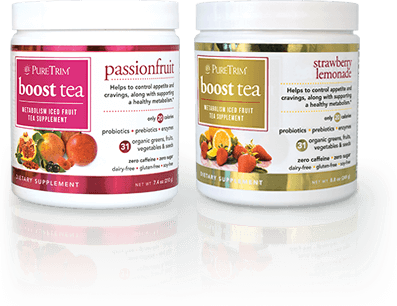 Boost Tea comes in an amazing passionfruit or strawberry lemonade flavor, with 31 organic greens, fruits, vegetables, and seeds designed to help you lose weight by fighting food cravings and supporting your metabolism. Organic acacia, Raspberry extract, Cinnamon bark, Brown seaweed, Mango seed extract, Potato tuber extract, Organic blue green algae (Spirulina), Organic chlorella, Organic beet, Organic cranberry, Organic red raspberry, Organic strawberry, Organic carrot, Organic blueberry, Organic pomegranate, Organic acai (Euterpe oleracea), Organic blackberry, Organic black raspberry, Organic cherry, Organic acerola extract, Organic apple, Organic apple pectin, Organic banana, Organic flax seed, Organic mango, Organic papaya, Organic peach, Organic pear, Organic pineapple, Organic tomato, Organic watermelon, Organic alfalfa sprouts, Organic barley grass, Organic broccoli, Organic green tea leaf (Decaffeinated), Organic kale, Organic wheat grass, Resveratrol, Bacillus coagulans, Protease, Amylase, Lipase, Acid Protease, Cellulase, Glucoamylase. Take twice daily. Add one scoop to 8 ounces of cold water with ice, and drink twice a day between meals. Have a third glass of PureTrim Boost Tea later in the evening if needed. Mediterranean Liquid Supplement. 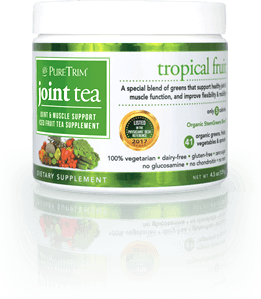 243 Vitamins, Minerals & Special Nutrients which Provide Energy, Reduce Stress & Supports Healthy Joints*. 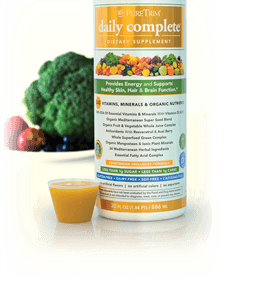 Contains 100% RDA of key Vitamins and Minerals, and other Nutrients. Take 1 ounce (2 tbsp) only once per day, during or immediately after a meal. Less than 4 calories per ounce, less than 1 gram of sugar. Do not use if pregnant. Keep out of reach of children. 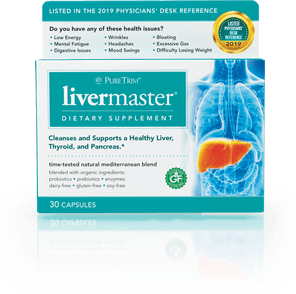 Cleanses and supports a healthy liver, thyroid, and pancreas. Vitamin E, Milk Thistle Seed, Blessed Thistle, Red Beet Root extract, Chlorophyll, Artichoke leaf extract, Eucommia leaf extract, Pine tree bark extract, cordyceps extrac, N-acetyl-L-tyrosine, Black pepper fruit extract, Rosemary leaf. Do not use if pregnant or nursing. Do not use if you are under 18. Experience promotes regularity and cleanses the colon. Take 1 capsule with a full glass of water before bedtime. Do not exceed 3 capsules per day unless directed by your health care practitioner. Do not use if pregnant or nursing. Do not use if you are under 18.